Hardware/software asset management for network admins. Is there a better alternative to NetMap? Is NetMap really the best app in Network category? Will NetMap work good on macOS 10.13.4? 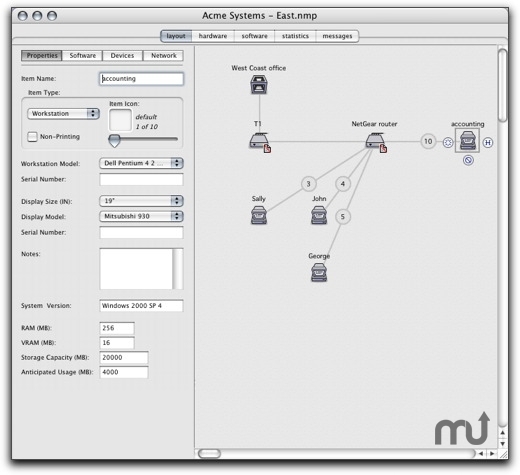 NetMap is a hardware and software asset management tool for network administrators. Using NetMap, network administrators can easily see an overview of established network devices and provides a single source for access to data such as software licenses, system versions and login information. Additionally, NetMap can be used to manage user requests for repairs or upgrades through a built-in messaging system. NetMap is an asset management tool that affords network administrators convenient and organized access to information about the network they manage; saving time and making the information technology process more efficient. [fix] Corrected the menu key for the "Delete Item" menu command. [fix] Corrected a label in the memory column of the hardware tab from "Free Space" to say "Used Space". [fix] (Windows) Adding items to the Item Types in the Map Settings window no longer causes NetMap to crash. [fix] (Windows) Changing unit type in the Map Settings window no longer causes NetMap to crash. NetMap needs a rating. Be the first to rate this app and get the discussion started! [fix] Network devices and printers no longer overlap subsequent items on printed maps. [fix] Changing units from inches to CM in the Map Settings dialog no longer resizes the netmap unnecessarily. [fix] (Windows) Selecting the location of the icon folder in the Preferences window now displays the full path as it should.